Welcome to the Tax Cuts and Jobs Act, 500 pages of far-right dreams smashed together in two weeks and rushed to a vote in the middle of the night. While there is an enormous amount of this plan that we should all be mortified about — specifically how it hoards wealth for the top 20% of Americans and steals money from the poor and middle class — there is far more going on here, much of which has little to do with tax “reform.” I worry that most people are not paying attention to everything it does over time, as evidenced by the fact that most of the people who voted to rush this through have not even read the whole plan, nor have there been any substantive hearings or analysis provided. 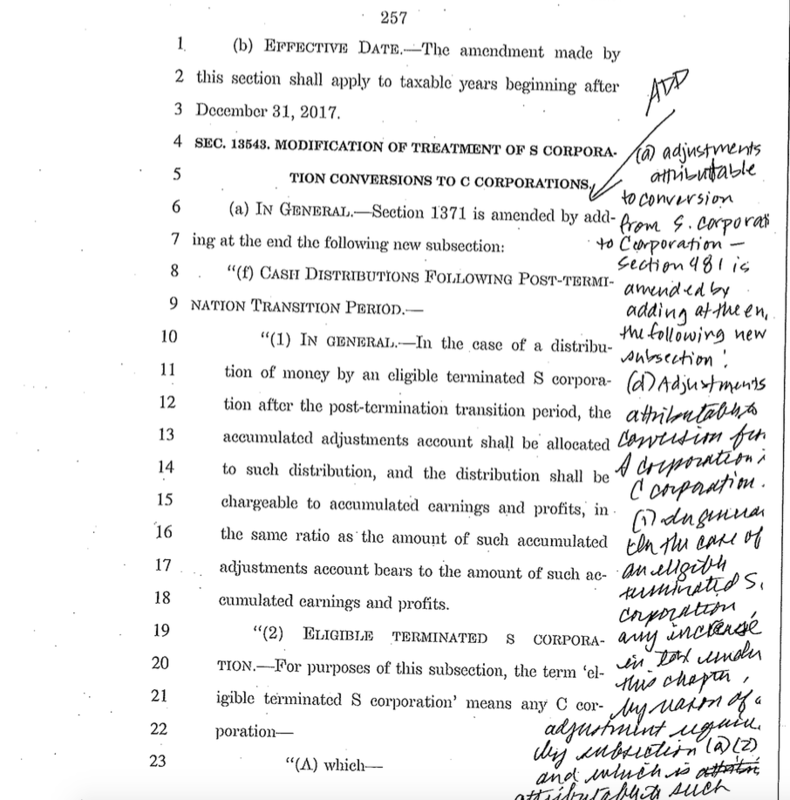 This massive document is also difficult to read because much of the marginalia is hand written scribbles, eliminating even concerned senators’ ability to read and understand the implication of the entire document before voting on it. In addition to the sociopathic maldistribution of wealth this plan secures, the social ramifications are profound and are antithetical to what we have worked so hard to accomplish in the ways of equity in the past 100 years. For example, this plan includes Medicare reductions that will end cancer treatment for people on Medicare. Yes, you read that correctly. This sounds like a death panel to me, and it should not come as a surprise, given that Paul Ryan and Mitch McConnell have been working to dismantle Medicare for years now. Oh, and as an added bonus it eliminates the Individual Mandate from the Affordable Care Act, basically robbing 13 MILLION Americans of coverage. As outlined in the Chronicle of Higher Education, this bill creates even more barriers for people who are not in the top 20% of Americans to afford a college education. For example, this bill puts additional taxes on charitable donations to colleges that allow for financial aid. Small liberal arts colleges are heavily dependent on charitable gifts to survive. The message is quite clear, the GOP does not value education, as further evidence that Betsy DeVos is the secretary of Education. People do your homework here! Obviously, the lack of access to eduction benefits the GOP, as it encourages ignorance and precludes critical thinking skills: skills that would allow people to ask questions of the government, the people that are supposed to be public servants. Another alarming part of this bill — so alarming I needed to get my smelling salts just to be able to write this — is the reversal of The Johnson Amendment. Yes, this is part of the Religious Freedom Act (specifically Christian agenda freedom) coming from the far right wing, which now controls our government. The Johnson Amendment, created by LBJ in 1954, prohibits all non-profits, or what is called a 501 (c) (3) from making any type of political endorsement or stand to lose their tax exempt status. Trump and his henchmen are now about to reverse this in this tax plan, but ONLY for churches, allowing them to become tax-free lobbying organizations. So much for separation of church and state. The bill slashes the corporate tax rate, eliminates the bulk of the estate tax, and changes “pass-through” business taxation in a way that benefits only the wealthiest of business owners. These changes are PERMANENT. The tweaks that MIGHT make a small change for poor and middle class taxpayers expire within the first three years. At the end of ten years, the vast majority of households making $75,000 or less will see their taxes rise, often by 20% or more. Many deductions are eliminated or severely curtailed including bike-to-work incentives, moving expenses, most mortgage and home sale deductions, tax preparation deductions, and disaster relief deductions. State and local tax deductions are greatly reduced, penalizing blue states that fund federal programs for red states. The bill will increase the deficit by at LEAST $1 TRILLION. So much for the party of fiscal responsibility. Deficit hawks like Sen. Flake and Sen McCain (the Arizona Stooges) believe that wealth will trickle down as businesses have more revenue, even though EVERY major corporation interviewed has indicated that the vast majority of this revenue will be used to pay bonuses and reward stockholders, giving no benefit to the average American. Sen. Murkowski sold out her constituents in exchange for getting drilling rights in the Arctic National Wildlife Refuge. Yeah, that’s a tax issue… Sen. Collins accepted a fig leaf promise for a vote someday on an ACA bill that won’t come close to solving the problems caused by the loss of the individual mandate. Sens. Johnson and Daines pretended that minor changes to the pass-through rules would help small business owners. Overall, over 20% of Republican Senators had major objections to the bill but voted for it with vague changes and vaguer promises. The most nefarious impact is yet to come. As that big deficit hole comes into reality, Republicans will certainly use it to insist on austerity measures. This is a feature, not a bug. As the deficit grows, they will insist that Social Security, medicaid, and medicare be slashed to balance the budget. Our only hope for derailing this monstrosity is putting pressure on the conference process that will reconcile the House bill (awful in many different ways) with the Senate abomination. Getting the House to accept all the little tweaks and odditities may be difficult, and losing them may make the final bill impossible to pass again in the Senate. TAKE ACTION: Contact your Representative and Senators and demand that they stop this horrible bill. It’s not tax “reform”, it won’t serve the middle class, it crushes the poor, and it includes elements that will reshape the social network and basic protections that we rely on today into something mean, nasty, and unrecognizable. Great article! Shared on Facebook. Small businesses already are fighting to keep their doors open and now with this plan they will be shouldering more of #corporatewelfare to their competitors. Hopefully this won’t turn into an even greater depression than the one that hit in the 30’s. Thank you, and thank you for sharing the article. Yes, this will be devastating to small businesses. This design is the perfect plan for those who are in the 20% to hoard wealth. Peace, Michael. I’ve learned through discussions in this group that facts and logic don’t matter. I can cite specific parts of the bill that are harmful, I can post research on how “trickle down” doesn’t work, I can detail all the reasons that private charities are problematic and insufficient, I can describe the widening income and wealth gap, I can cite articles showing how effective the War on Poverty was when we actually put resources into it… None of it impacts them in the slightest! It’s like they are brainwashed! Especially the pro-Trump conservatives, who have mostly left the group. I personally think they are a lost cause and their pride will keep them from ever admitting that he is bad. Have you had ANY luck getting everyday conservatives to see how viciously the GOP is attacking them? 4) Obama/Hillary/Democrats were/would be/are be much worse! Chelsea, yes, this type of false logic, I just let go. This population seems implacable and does not hold much capacity for reflection. Sadly! Peace, Michael. Hi Chelsea, really good question you raise. My experience has been to share, in a non-blaming way, how this plan will directly and negatively impact people. For example, they are going to dismantle social security and medicare–most people are not aware of this as part of the plan. Thank you for reading and commenting! Peace, Michael. Thank you for shining a bright light on this murky morass of immorality! I have little faith in congressional Republicans, but this bill exceeded my worst expectations by several orders of magnitude. We must all do our utmost to keep a conference bill from passing. Hi Bevan, YES! We must all do whatever we can to prevent this monstrous bill from passing! Thank you for all of your support and wisdom. Peace, Michael. Behind this bill is a deliberate desire to cut social security, medicaid and medicare. In one word: crushing millions of people. So if some points of the bill appear attractive now, they are only bait. Anyone who differs has not paid attention. Thank you, Michael. As always your posts are right on. Evelyne, thank you for reading and commenting! I always feel so grateful for you! Thank you for consistently working to make the world a better place for all! Peace, Michael. I am fortunate enough to have one of the more progressive Reps in the House (Slaughter.) Our Senators are more centrist, but fortunately at least one of them loathes Trump. I can count on my legislators. That said, sometimes professional troublemaker that I am, I will be helping those not in that situation put the heat on their elected employees. We beat the ACA repeal, we can beat this. Oh Christine, let us hope you are right! I am really quite fearful with how hard they are trying to push this through with no regard for humanity. Lots of love and peace to you, Michael. From your lips to the Universe’s ears! Good heavens you’ve monetized things. I was recently doing more than idle searching for jetted tubs with shower and a site I visited decided to say hello to me right here. Such a pity about Sue Grafton, Robert. I always felt she was the best of ‘your’ writers in terms of clicking with my sensibility. Utterly off-topic, but what the hell. I’m still a bit frightened of Facebook. Tonight, in mid-January, I learned while doing my 2017 taxes online that the IRS is behind in preparing this tax season’s 1040, so I cannot file my federal or state taxes yet. My efforts to gather my records and be prompt were trumped (and McConnelled) by the mess that was the Job Cut and Tax Act (it will someday be called that, I’m sure). Mitch McConnell rushed so many dozens of sloppily done tax break provisions into the law — some hand written — that the IRS is snowed under trying to figure how to word the 1040. It’s as though Mitch rushed the job because he is afraid the Republicans won’t control Congress next year. And sadly, the GOP passed this nefarious plan when 80% of the population disapproved of it. So much for public service. 😦 Peace to you my friend! Haven’t kept in touch because I have (minor in comparison to yours) medical issues of thyroid problems. My prognosis is good. Symptoms are fatigue and weight loss. Regarding your health, I wish the very best for you, Michael! Brian, I am so sorry about your thyroid problems and I’m so grateful that the prognosis is good. I had two massive heart attacks on December 20th and thus have been quite absent. I shall be back in the next few weeks. Lots and lots of love to you! Oh my goodness, Michael. Continue to take care, and know that we are all with you. Your strength and resilience are amazing!